This article is reprinted with permission from SutroForest.com, a website that has been reporting on the Mission Blue project for some years. On Tuesday, April 19th, 2016 (tomorrow!) the San Francisco Municipal Transportation Agency(SFMTA) Board will consider approving the proposed Twin Peaks Figure 8 Redesign Pilot Project, a cross-departmental project of San Francisco Recreation and Parks Department (SFRPD) and the SFMTA. The meeting (which is of course open to the public) is at 1:00 p.m. in City Hall, Room 400. Here we go again – the shrinking of our parks by the Natural Areas Program (NAP). Instead of allowing visitors to experience wide natural lands, these plans want to restrict access to a very limited trail system. From these trails, you can look at the natural areas – but not touch or explore them. It’s happened in McLaren Park recently. Now, San Francisco Recreation and Parks Department (SFRPD) is planning major changes on Twin Peaks. Extensive trail closures are planned for Twin Peaks. In the map below, the trails that will be gone are marked in red. The project was positioned as one that would close half the Figure 8-shaped roadway to cars to make it safer for pedestrians and bicyclists by making it a Figure 3-shape. What they didn’t publicize was plans to close most of the trails allowing access to the peaks from various points. They will make the entire south side of Twin Peaks inaccessible. Notice that there was no discussion on Trail closures as part of these Project Objectives now, in 2015. 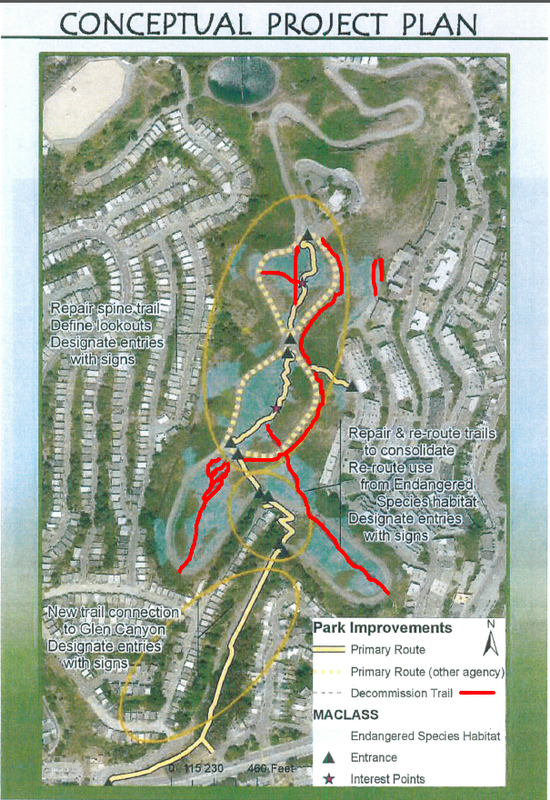 This trail closure plan was also part of a handout used at a small May 7, 2015 stakeholder meeting. We strongly suspect these closures remain part of the RPD plan, but they do not want to alert the public. The trail closures, along with the new “Stay on Designated Trails” signage, would effectively close off public access to the south side of Twin Peaks. SF Forest Alliance feels that NAP is going above and beyond the Significant Natural Resource Areas Management Plan (SNRAMP) before the Environmental Impact Report (EIR) is even released and approved. They are using the Draft EIR as a decision-making document to decide which alternative to approve. They are putting out the road lane closure as the focus of this and then sneaking in the trail/land closures as part of the deal. Also, please call your supervisor and let them know as well. As usual, SFRPD is being disingenuous. Here is what you can do. Take this Project survey – put up by SFRPD – and let them know you oppose outright trail closures on Park lands. There is a box near the bottom of the survey where you can write in your comments about trail closures. 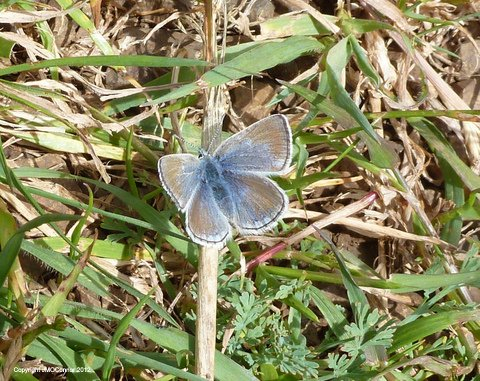 We’ve been reporting that San Francisco’s Natural Areas Program (NAP) has been spraying increasing amounts of toxic pesticides in parks used by people, pets, and wildlife. The San Francisco Department of the environment restricts the use of pesticides of land owned by the city, and it classifies permitted chemicals into three tiers: Tier III is the least hazardous; Tier II, more hazardous and Tier I, most hazardous pesticides. 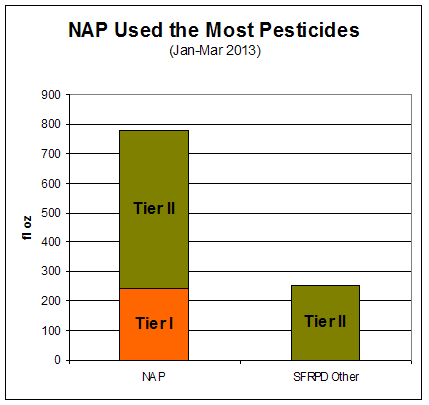 Recently, someone asked us how NAP’s Tier I and Tier II pesticide use compares with the rest of SF Rec & Parks (SFRPD) usage. We hadn’t compiled the numbers (and neither, as far as we know, had the city). But we’ve done so now for the first quarter, Jan-March 2013. It’s pretty bad. NAP used three times as much of the most toxic chemicals as all the other SFRPD departments put together. NAP was the only department to use Tier I herbicides. 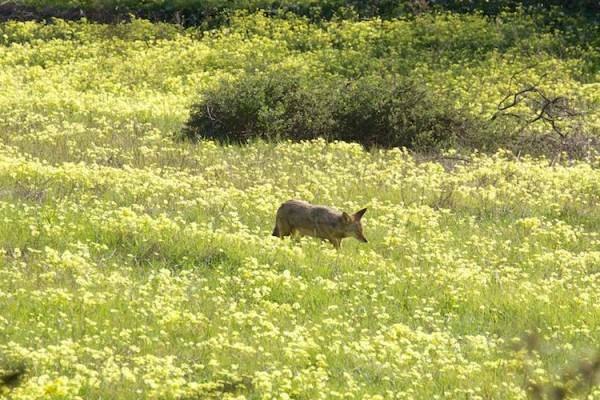 They used Garlon 4 Ultra against oxalis in McLaren Park, Bayview Hill, Twin Peaks, and Mount Davidson. No other SFRPD area used any Tier I herbicides. 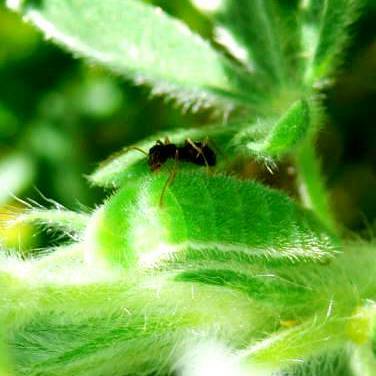 NAP doesn’t use any Tier III pesticides. Our “Natural Areas” are getting hit with the most toxic chemicals the city permits. Which areas did they target? In March, it was Mc Laren and Glen Park. In February, it was Twin Peaks, Mt Davidson, Lake Merced, Pine Lake, and Oak Woodlands in Golden Gate Park. In January, it was Bayview, McLaren, and Twin Peaks. 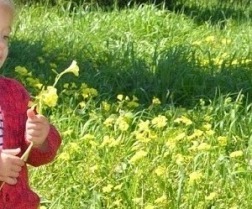 Most of the pesticides used by NAP were applied by the contractors, Shelterbelt.